Month six Tigress’s can jam canning challenge and for June the choice of ingredients is positively bountiful with anything ending in ‘..erries’. As if that wasn’t enough, after other can jammers queried what that meant, the category was widened even further to include anything ending in ‘..urrants’ as well. I am just hoping that we haven’t covered the whole soft fruit spectrum in one fell swoop. With summer officially about to begin, at last the preserving year is shifting up a gear and a dearth is just starting to resemble a glut. After last months project, my rhubarb ketchup, that was a success but in a brown kind of way, I’ve been yearning for something colourful and British, something that sings a song of summer, con brio, whilst at the same time celebrating the beginning of the soft fruit season. So gooseberries it is. I have cooked with gooseberries before but not to any great extent. Gooseberries are another fruit that seem to grow easily and yet are underused and under appreciated, an old fashioned country berry with an unfashionable reputation. This is another one of those puzzling fruits that is everywhere but at the same time hard to find. You either have to grow your own or know someone else who does. I’ve recently planted a few bushes on my newly acquired allotment, and though there wont be any crops to harvest this year, hopefully they will bear fruit-a-plenty in the years ahead. Varieties come with down to earth names, like Leveller, Invicta and Pax, very much old-school allotment sounding. More recently food writers have started to feature gooseberries, so perhaps they are on the cusp of a renaissance. 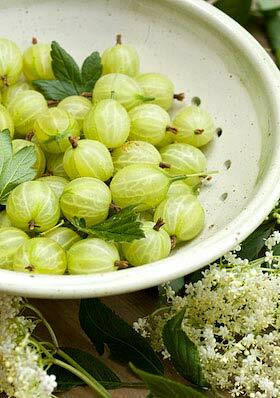 For the canjam I have chosen to make a gooseberry and elderflower jelly. There is something so pure and delicious looking about jellies and in this instance the end colour, though a glorious pinkish amber is nothing like the fresh green that the fruit starts out as. I have read that if you cook gooseberries in a copper pan they retain their green colour, but as I have no direct experience of this, I am loath to pass on the information parrot fashion. In my stainless steel jam pan, green gooseberries tend to turn an unappealing khaki colour as they cook but once the extracted juice and sugar begin to work together, an altogether more magical hue develops. Elderflowers make a classic partnership with gooseberries and should be ready for picking at the same time, though the flowers are much more fleeting. Here, in the Forest of Dean, the flowers have been in bloom for about two weeks but the berries are only just starting to ripen. I’ve used fresh elderflowers but you could use elderflower cordial instead if the only flowers to hand are past their best. There’s no need to top and tail the fruit. Place fruit in a pan with 1 litre (1 3/4 pints) of water. Add the elderflowers and heat the pan, bringing to a simmer, then cook gently until the berries are soft and start to burst. Pour into a jelly bag (that has been sterilised by boiling for 5 minutes beforehand) suspended over a bowl, add the juice of the lemon and leave to drip overnight to collect all the juice. Discard the pulp remaining in the bag and measure the juice. Pour into a preserving pan and add 450g (1lb) of sugar to every 600ml (1 pint) of juice. Prepare the water bath, jars and seals ready for canning. For more info about how to hot water process, refer to the guide here. Stir the syrup over a low heat until the sugar is completely dissolved then turn up the heat and boil rapidly to reach setting point. To test for a set, drip some syrup onto a cold plate and see if it quickly forms a skin that will wrinkle when you push your finger across the surface. Alternatively, use a jam thermometer and when it shows 105C (220F) you know setting point has been reached. (I usually employ both methods at the same time to be on the safe side!) Pour into the jars leaving required headroom for your type of jars, seal and hot water process for 10 minutes. Remove the jars from the water bath and leave them till completely cold before testing the seals are vacuum fixed. Label and store. You can omit hot water processing if you wish as a jelly of this type should store well without, but processing makes it extra safe and will mean the jelly should keep for a year or longer. At GMT minus zero you’ve definitely got dibs on the first post, and this is a lovely way to start our “erry” fest! Clearly, this is a success in a jewel-toned way. 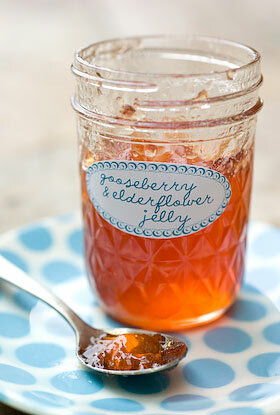 Your jelly is purely gorgeous. And maybe Tigress will be able to tell us, eventually, how gooseberries behave in a copper pan. This looks gorgeous!!! Unfortunately, it’s not gooseberry season here yet – we’re in the middle of strawberry season. Gooseberries weren’t ready yet when I went out this morning to a local farm…I am satisfied for now by just reading your post, that is one beautiful jelly! 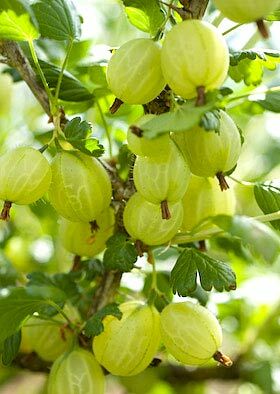 I so love gooseberries! Your look gorgeous! 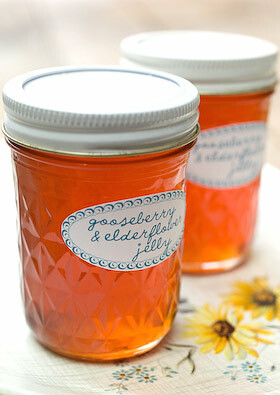 …someday i hope i’ll have enough berries growing to make a pie – i hear gooseberry pie is to die for. tho i’m too busy throwin’ them all in jars! Also, where do you source those gorgeous jars? !